The use of explosive materials by criminals and terrorist groups poses a significant threat in every country. 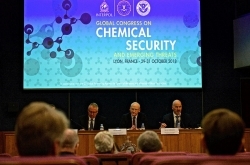 Attacks using explosives and chemicals endanger public safety on a large-scale, and can severely impact the economic and political stability of countries. High-profile incidents have affected all regions of the world; the past decade has seen thousands of bombings around the world including in Brussels, Abuja, Boston, London, Madrid, Moscow, Mumbai and frequent chemical attacks in Syria and Iraq. At INTERPOL, we support member countries to prevent, prepare and respond to the use of chemicals in terrorist incidents. We work with them to prevent criminals from diverting, smuggling and using chemical warfare agents, toxic industrial chemicals and explosive precursor chemicals. We offer a range of training courses and expertise to counter these crimes, which require specialized knowledge especially in handling evidence. Project Watchmaker is a global initiative offering specialized support to member countries by using INTERPOL’s notice and diffusions system to alert law enforcement officials worldwide about people using or manufacturing improvised explosive devices. INTERPOL’s Watchmaker dataset contains profiles of over 3,500 people and 38,750 entities associated with chemical, biological and IED activities. It includes individuals responsible for major terrorist bombing incidents around the world. Our capacity building and training projects are designed to improve chemical security in member countries so they can prevent the smuggling of chemicals across international borders. We help countries to identify, interdict and investigate the illicit diversion of chemicals. 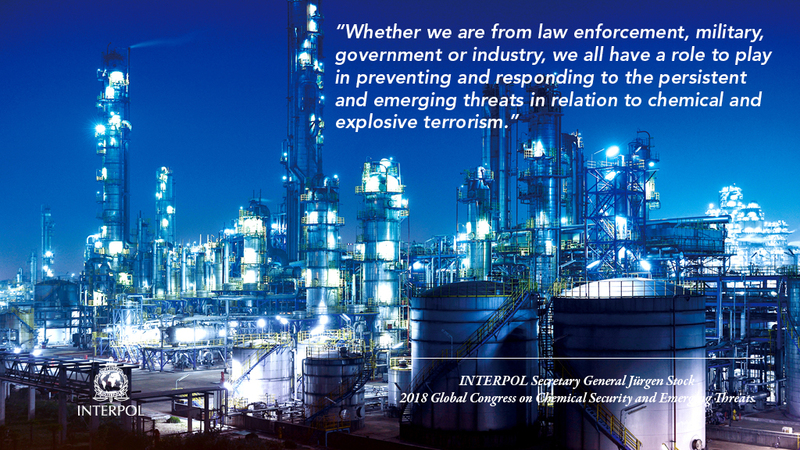 These training courses target government authorities, police services and the chemical industry, and develop the knowledge and leadership skills of senior law enforcement officials based in border and chemical security agencies. We run operations at air, land and sea border points during which we work with member countries to target the illicit smuggling of chemicals and criminals who use them in the manufacture of weapons designed to kill and injure indiscriminately.